How many guests can you accommodate for a wedding reception? Yes—we have two restrooms inside the barn. We recommend supplementing the barn bathrooms with rented restrooms if your guest list is over 100 people. can we supply the alcohol? Yes—but you are required to employ an insured bartender to serve it. Also, we don’t allow cash bars at Live Well Farm… guests shouldn’t have to pay for their drinks! Can we have our rehearsal dinner on-site? Yes you can! Just ask us for more info. We’re also happy to help you get set up with a traditional lobster bake for your rehearsal dinner, if you’d like. Yes—there is on-site parking available for up to 40 cars. We recommend hiring additional transportation to help with overflow. Our staff provides assistance for parking direction and bus arrivals. You’re only 20 minutes from charming downtown Brunswick, the home of Bowdoin College and lots of great restaurants, boutique shopping, hotels, and art galleries. Because Live Well Farm is at the end of the Harpswell peninsula, we are surrounded by beautiful water activities, nature trails and seafood restaurants… there is a lot to see and do! What if we want to get married in a church or on the water? We are surrounded by options! Johnson Field at Mackerel Cove is a popular choice for ceremonies on the water. For churches, Elijah Kellogg in Harpswell is beautiful (and just down the road), and there are many options for places of worship in Brunswick. Just ask us for more info. We only book one wedding per weekend, so the Farm is all yours! If you have rented for the weekend then check-in is at 3pm on Thursday and check-out is at 12 noon on Sunday. Early check-in and/or late check-out may be arranged for a fee. If you are renting for one day only, check-in is at 9am and check-out is at 11pm. Are there specific vendors we need to use? No. 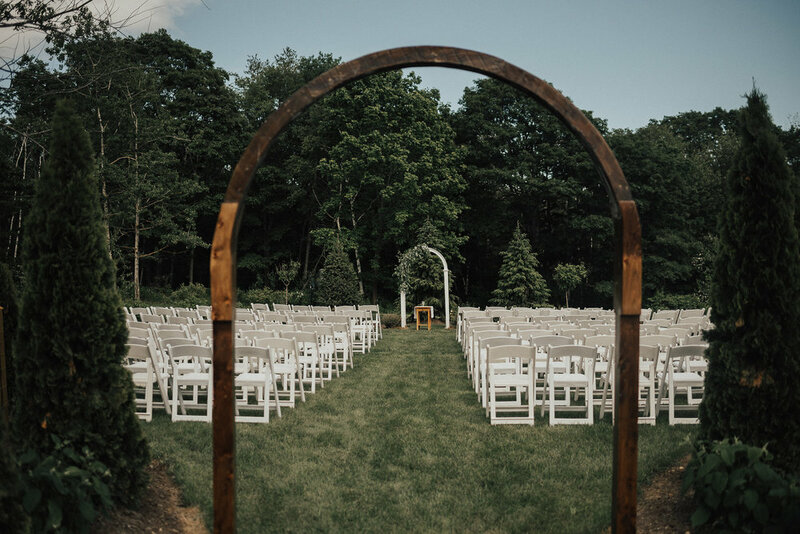 It’s important to us that you are able to craft your reception to reflect your individual personalities and desires, so we do not restrict your vendor choices—just make sure they’re insured. We are more than happy to provide recommendations, and we do have a list of preferred vendors—check our website! Is there on-site lodging for guests? Yes—if you have rented Live Well Farm for the weekend then there is accommodation for up to 11 guests in the farmhouse. Is there heat or air-conditioning? Each room has its own fan, but the ocean breezes usually provide all the A/C you’ll need. The farmhouse is heated, but of course we hope you won’t need it in the summer season! Two patio heaters are available for outdoor warmth. The barn is not heated, but once the dancing starts everyone is warm! Can Live Well Farm also plan my wedding? Yes! Not only do we provide guidance along the way, but (depending on availability) we also have an on-site wedding coordinator to assist you. This is a separate fee, and if you’re interested you will receive a proposal tailored to your planning needs. We do require that all of our couples employ an event coordinator who is present on the day of your wedding. This is a huge help for your peace of mind and to ensure your day runs smoothly.